Shangri-La at the Fort, Manila is the newest Shangri-La Hotels & Resorts property in the Philippines which opened last March 1, 2016. 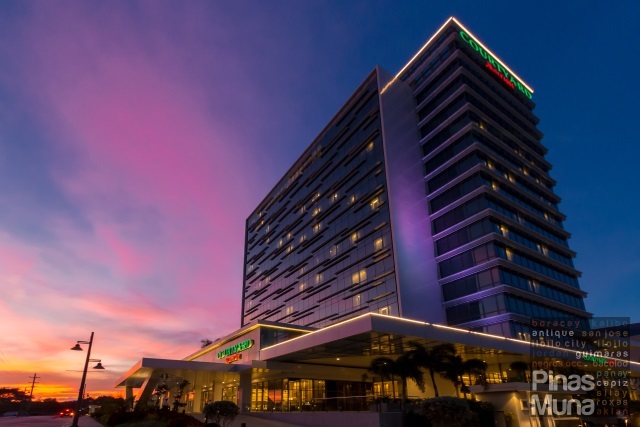 While the hotel was on soft-opening, there was limited room available in this most sought after hotel in Metro Manila. 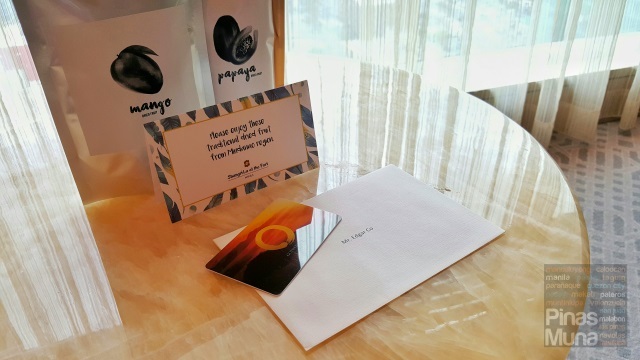 We were very lucky to be one of the first guests to experience this sparkling new property when we had a staycation at Shangri-La at the Fort, Manila on its opening day. 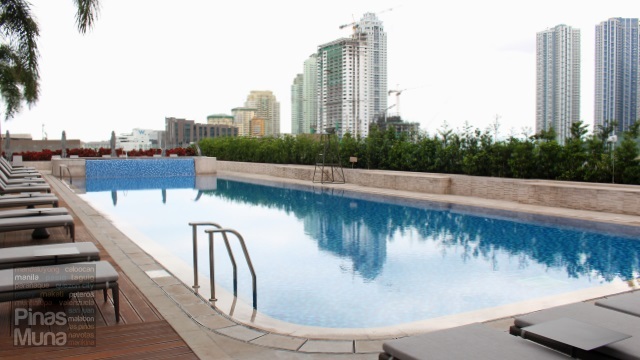 Shangri-La at the Fort, Manila is a mixed-use development located at the corner of 30th Street and 5th Avenue, in Bonifacio Global City (BGC), the emerging new financial and contemporary lifestyle capital of the Philippines. 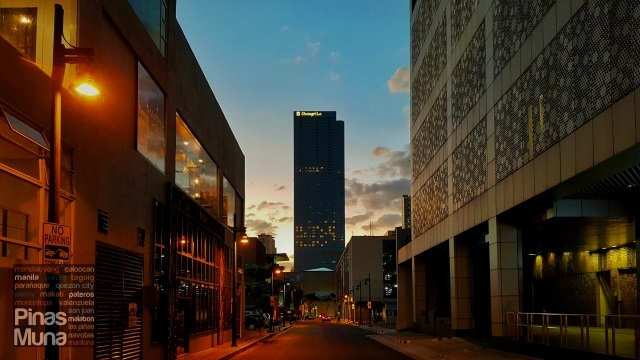 Dominating the BGC skyline at 250 meters high, this luxurious landmark features a 576-room luxury hotel, a serviced residence, stylish homes situated on the top floors, retail shops, and a comprehensive lifestyle and fitness club. The hotel is accessible from a ramp connecting from 30th Street. From the driveway, you can already smell the signature Shangri-La fragrance, the same scent you will smell in all Shangri-La properties around the world. Welcoming you at the lobby are the hotel's team of concierge who will assist you with your bags to the hotel's front office. 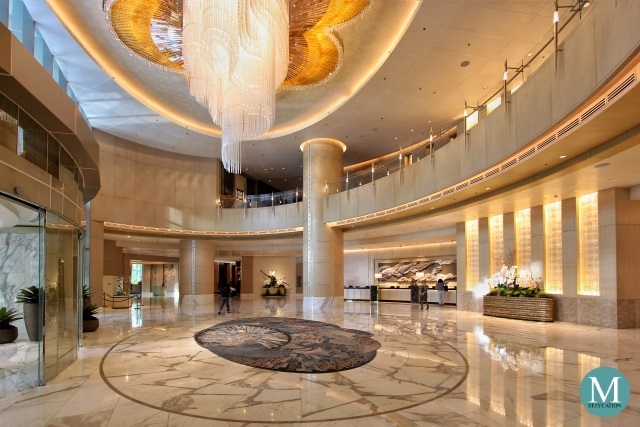 If you are a fan of the Shangri-La hotel brand here in Metro Manila, you will instantly notice that instead of a magnificent floral arrangement as a centerpiece, the lobby of Shangri-La at the Fort, Manila features a grandiose chandelier that is said to resemble a woman's necklace. This extravagant lighting sculpture is designed and made by Lasvit, a Czech manufacturer of bespoke lighting installations. As you approach the front desk, your eyes will be drawn to the feature wall adorned with an artwork by Filipino interior and bag designer, Bea Valdes. This specific art installation is made with silk, tulle, metal mesh, resin & crystal beads sewn together by hand using metal thread. 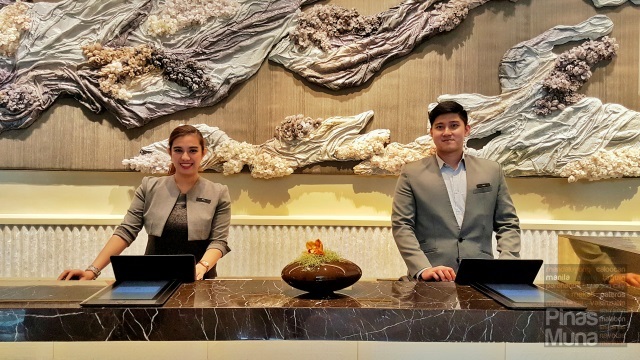 You will then be greeted by the warm and welcoming smile of the guest services team. Service is consistent with all Shangri-La properties: hospitable, engaging, caring and with a personalized touch. Our check-in was processed by Ms. Grace of the front office. We booked an overnight stay in a Deluxe Room which was in an introductory rate of P9,800++. Check-in was quick, especially for Golden Circle members. Our electronic registration form was already pre-filled with my personal details, so I just had to validate the information. 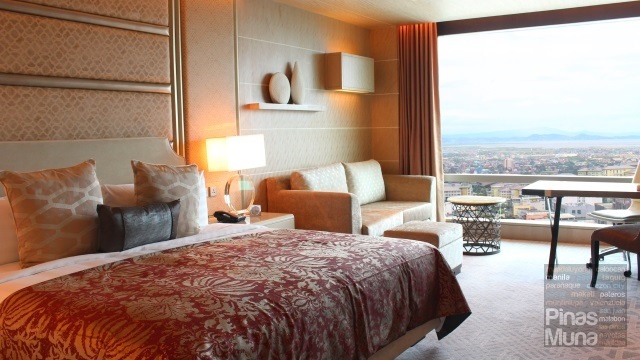 Being Golden Circle members, we also received an exclusive upgrade to a Deluxe High Street View Room. 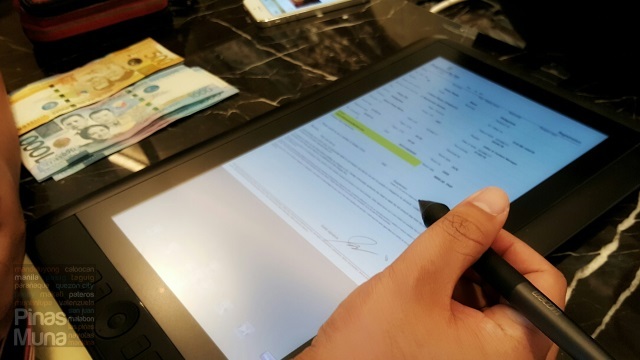 After electronically signing the registration form and making an incidental deposit of P4,500 per night, we were immediately issued with our electronic key cards. It was nice of Ms. Grace that she even assisted us to our room. On our way to our room, she shared more details about the property such as the amenities available to checked-in guests, and the other F&B outlets that will soon open at Shangri-La at the Fort, Manila. Walking along the corridors of the hotel, we were even more impressed by the amount of work did to decorate the interiors of the hotel. Most admiring were the barong tagalog fabrics that adorn the walls of the corridors. 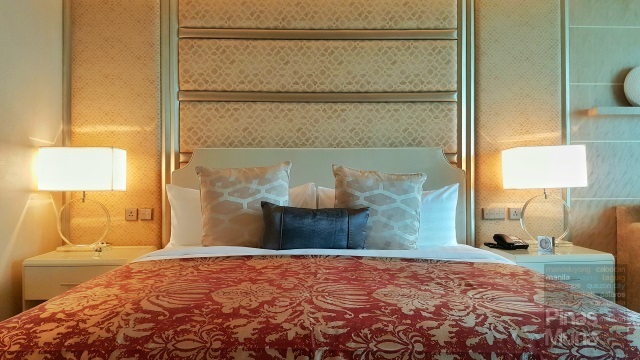 The geometric patterns embroidered on the fabric took inspiration from the crystal pieces of the hotel's chandeliers. 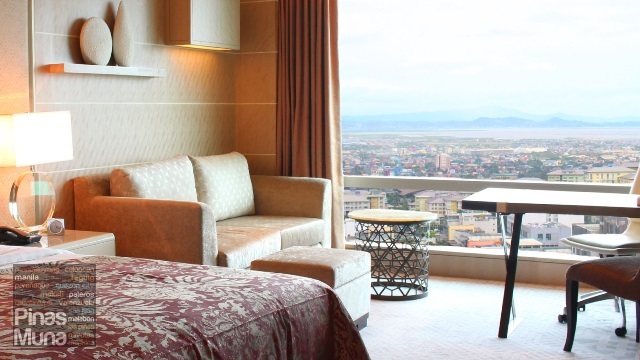 We stayed at room 2405, a Deluxe High Street View Room located on the 24th floor with a spectacular view of the Bonifacio High Street with the Laguna de Bay and Sierra Madre at the background. 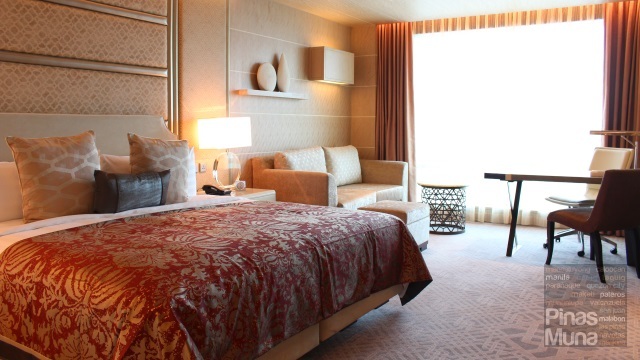 In terms of room size and amenities, it is basically the same as a Deluxe Room. Deluxe Rooms are luxuriously spacious at 45 sqm which are furnished with a king size bed, bedside tables, a sofa, an ottoman, a coffee table, an executive writing desk, a spacious wardrobe, a luggage rack, and an ensuite bathroom with separate shower cubicle and deluxe tub. Our first impression of the room was a deeply homey feeling in an amazing space that felt like a luxury home at the heart of the city. The room exudes the elegance of Shangri-La's Asian heritage with a strong connection to Filipino design as seen in the patterns and textures used throughout the room, and with contemporary décor in a silver and dove grey and muted beige color palette lending more elegance to the space. Highlight of the room is the king size bed. It features a Simmons mattress, a global leader in mattress manufacturing and a trusted brand by the world's biggest hospitality groups. The pocketed coil mattress delivers excellent back support and exceptional motion separation for that comfortable and uninterrupted sleep. The mattress is covered with a topper that contours to the shape of the body. The bed is then tightly tucked-in with a 300-thread count top sheet. Finally, a down feather duvet encased in a silky smooth cotton cover adds warm and extra comfort. Next to the bed are bedside tables with enough surface space to place a book or a magazine, or your phone or tablet while being charged to the power outlet next to the bedside lighting controls. Sink into the sofa and lounge in comfort as you read your favorite book or channel surf with your legs resting on the ottoman. The floor to ceiling glass curtain wall opens up to a spectacular view of the city and allows natural light to enter the room. 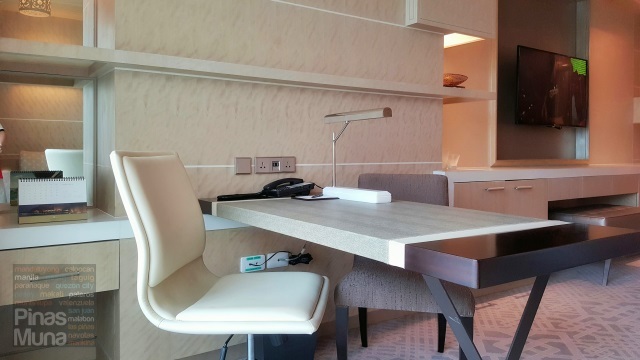 The executive writing desk is perfect for business travelers. There's power outlet right next to the desk and high speed WiFi Internet connection is also available. In-room dining is also available through the hotel's room service. 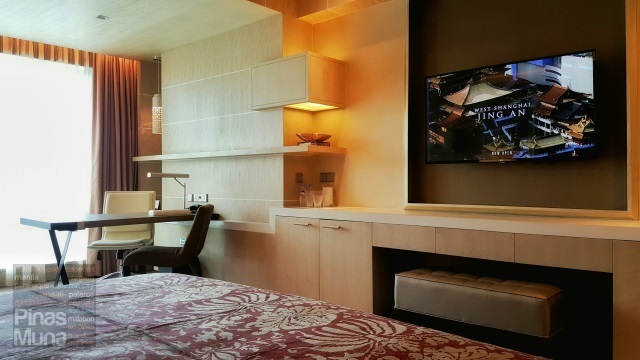 For staycationers and leisure travelers, the desk will be the center of your activities inside the room, from playing with toys and coloring books, to watching iFlix on your tablet, from playing board games with the kids to playing cards with your friends. 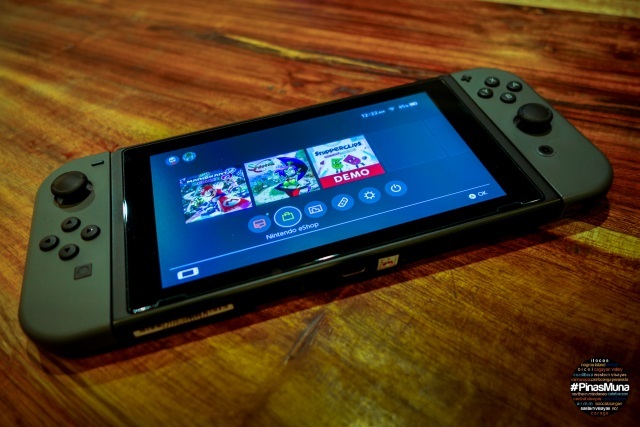 With a 48-inch flatscreen television with cable channels and smart access installed in the room, you'll never run out of entertainment options during your stay. The ensuite sound system includes speakers inside the bathroom. Other room amenities include an electronic in-room safe which can fit a laptop, an iron and ironing board are smartly concealed in a sliding vertical compartment next to the wardrobe. Complimentary bottled drinking water, as well as coffee grounds and tea bags are provided. There's an electronic kettle which you can use to heat water. The minibar contains sparkling water, bottled juice, canned beer and soda. There's also a number of chips and chocolate bars available in the minibar. 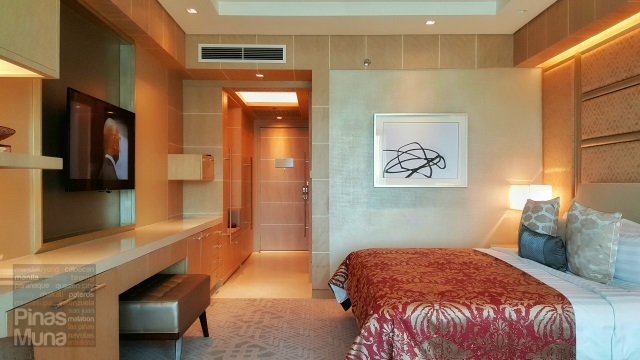 The Deluxe Room has an equally spacious ensuite bathroom. 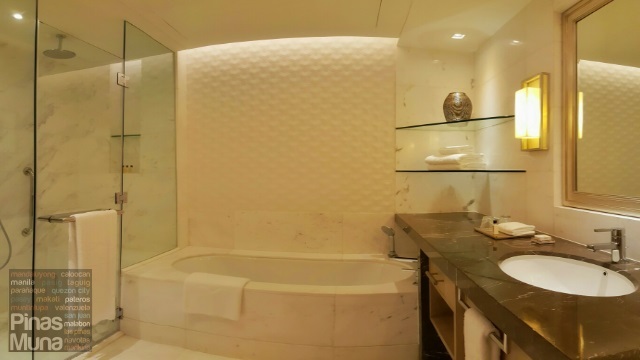 The bathroom floor is lined with marble, as well as the walls and the bathtub perimeter wall. There's a single basin with a large mirror mounted on the wall. And because the mirror is heated, it doesn't get foggy after showers. There's also a magnifying mirror and hairdryer installed next to the basin. The countertop has so much space where you can put your personal toiletries. The bathroom has a separate walk-in shower equipped with a handheld showerhead and a rainshower head mounted on the ceiling. There's hot and cold water and temperature is easy to regulate. Water pressure was excellent. Plush towels made of thick cotton are provided, as well as bath robes and slippers. 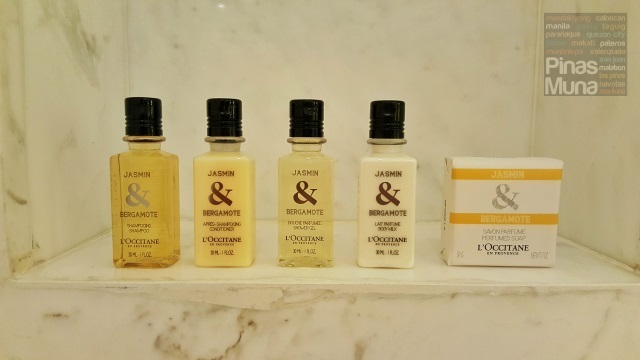 Shangri-La at the Fort, Manila provides Jasmin & Bergamote body and bath amenities including shampoo, conditioner, shower gel, body lotion and perfumed soap. These luxurious toiletries are part of La Collection de Grasse by l'Occitane en Provence which features fragrances made with jasmine absolutes from Grasse, Provence and Egypt, and bergamot essential oil from Italy. After getting settled in our room, it's time to sample the afternoon tea offerings of High Street Lounge. 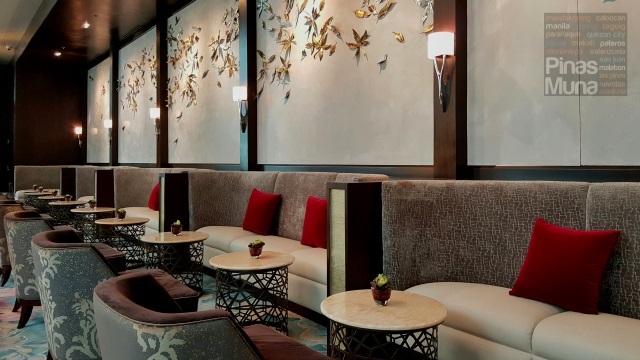 Located on the same floor as the lobby, High Street Lounge offers a wide selection of beverage, from coffee to tea, and from beer to cocktails. 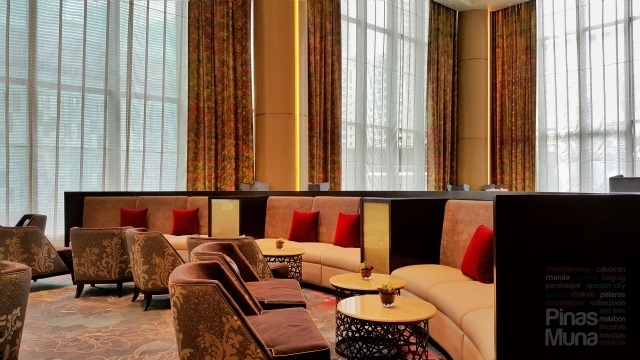 High Street Lounge features a chic yet relaxed atmosphere with the floor-to-ceiling windows that bring in natural light, and elegant sofas that add more luxury to the space. 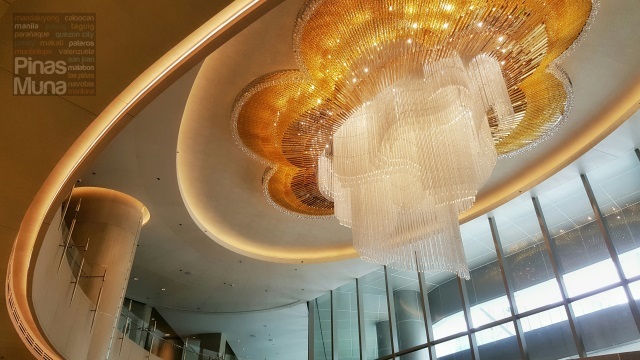 Adding grandeur to the lounge is another Lasvit chandelier hanging from the high ceiling, with 5,000 individual pieces made of hand-blown glass. The feature wall is decorated with an artwork by Filipino visual artist and sculptor Jinggoy Buensuceso featuring leaves made of metal which took inspiration from five different trees native in the Philippines. High Street Lounge offers afternoon tea which is available in two different sets. The West set includes an amuse bouche, scones and jams, savory sandwiches, cakes and pastries. The East set, on the other hand, also includes an amuse bouche, scones with Asian inspired jams, a variety of savory rolls, buns and dumplings from different parts of Asia, as well as Oriental inspired pastries and cakes. Each set costs P950 nett which already includes tea or coffee for two persons. We'll tell you more details about their afternoon tea offering in a separate post, so do watch for it. Come evening time, BGC livens up as various restaurants are filled with diners from nearby offices and condominiums. The options are really endless. 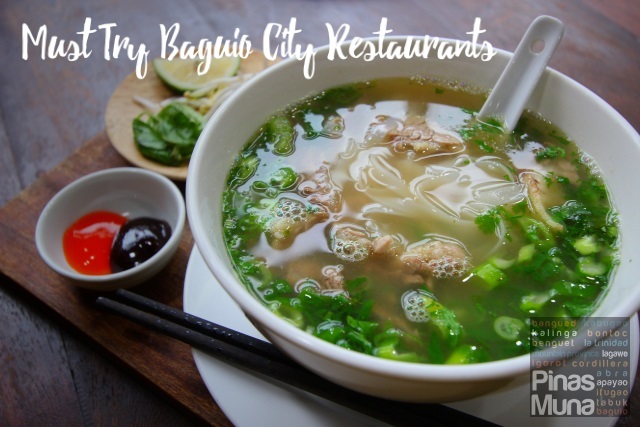 BGC restaurants offer a very diverse selection of international and local cuisines, some of which are just located right outside the doorstep of Shangri-La at the Fort, Manila. But staycationers actually need not to go far. Right beside the front office is High Street Cafe, the hotel's all-day dining restaurant which serves buffet lunch and dinner, as well as a la carte dishes from various parts of the world. 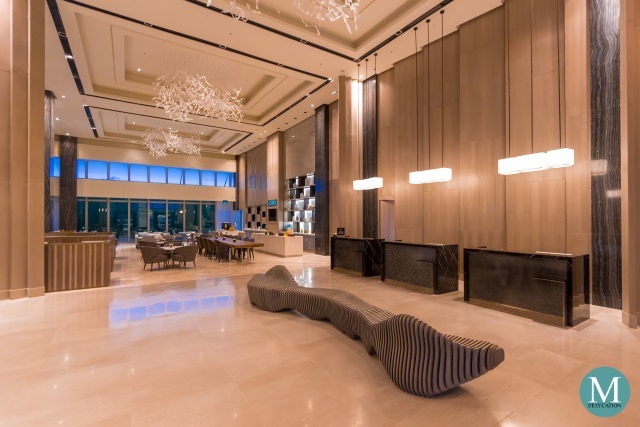 The restaurant has a very contemporary design with a stylish food hall feel, moving away from the stiff and often intimidating fine-dining format of traditional hotel F&B outlets. High Street Cafe has a young vibe that is upbeat, yet maintaining the high level of service that Shangri-La is known for. With shelves serving as dividers, the interior of the restaurant is designed to look like a chef's library, a place where culinary experts can explore new flavors and express their culinary creativity. The buffet is divided into nine live cooking stations, including Western, Pan-Asian, Chinese, Japanese, Mediterranean, rotisserie, seafood bar, salad bar and desserts. High Street Cafe offers their buffet at very friendly prices, very competitive in the BGC area. Lunch buffet is priced at P1,550 nett per person while dinner buffet is at P1,900 nett per person. Prices are the same for every day of the week, including weekends and holidays. For a post-dinner nightcap, guests can proceed back to High Street Lounge. This change of venue from a high energy buffet restaurant to slow-paced lounge will signal the body to mellow down into the night. Guests can choose among classics, whiskey or brandy, or go for an after-dinner drink of cocktails. Here are two gin-based cocktails we tried at the High Street Lounge. On the left is High Street Market (left) which is an interesting blend of gin, fruits and herbs, while on the right is our new favorite cocktail, the Brilliant Cure which is a beautiful blend of gin, Chamomile tea extract, citrus fruit and egg whites. Back in our room, we dimmed the lights and it didn't take long for us to fall asleep. We had a long and uninterrupted sleep thanks to our very comfortable bed and pillows. 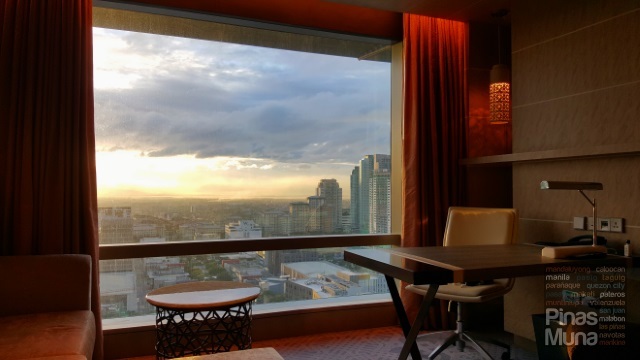 Waking up to a spectacular sunrise by the window is one of the most memorable experience we had during our stay at Shangri-La at the Fort, Manila. Although facing the sun, the coated glass curtain wall allowed sunlight into the room while filtering out the heat. At 7:00am, we went down to the 5th floor to check out the fitness center. 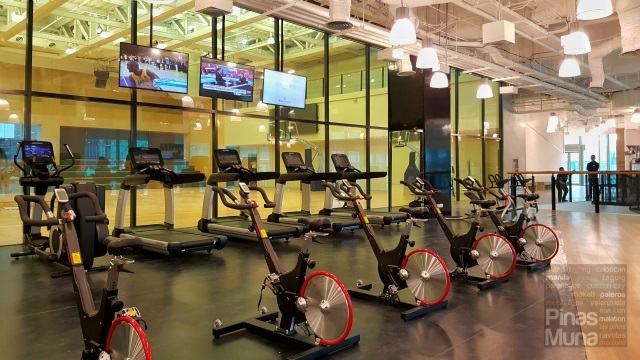 Kerry Sports Manila is a comprehensive sports and leisure club with extensive gym facilities with state-of-art fitness equipment, as well as an NBA-grade indoor basketball court. There's also two tennis courts, two squash courts, an outdoor lap pool. 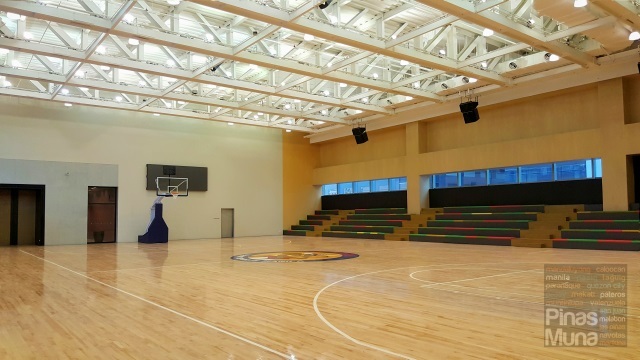 Use of the Kerry Sports Manila facilities are exclusive to club members as well as to checked-in guests of Shangri-La at the Fort, Manila. Our overnight stay at Shangri-La at the Fort, Manila included buffet breakfast for two persons at High Street Cafe. The buffet features a wide selection of local and international dishes, some of which are a unique offering here at High Street Cafe. Buffet stations include Continental, Fresh Fruits, Filipino, Chinese, Japanese, Noodles, Omelet, Yogurt & Salad, and Pastries & Desserts. We recommend the seats located next to the glass windows where you can enjoy a pleasant view of the Mind Museum park. Here are some of the dishes we tried during our breakfast: stir-fry noodles and an assortment of steamed and fried Asian dimsums, selected sushi, noodle soups, fresh fruits and ice cream. Our top favorites are the dimsums, the laksa, the Taiwanese beef noodles and the Davao dark chocolate ice cream. Buffet breakfast is available daily from 6:00am to 10:30am. Walk-in guests can also avail of the buffet breakfast for only P1,200 nett per person. Do watch for our detailed feature on the buffet breakfast at High Street Cafe. It was indeed an amazing two-day stay at Shangri-La at the Fort, Manila. This new property is absolutely impressive, the rooms are uniquely designed with utmost attention to details. Food was exquisite and service was outstanding. Most importantly, you get great value out of your money. This is truly luxury redefined. We've stayed in many hotels in Metro Manila, and no other property can match this experience that is Shangri-La at the Fort, Manila.